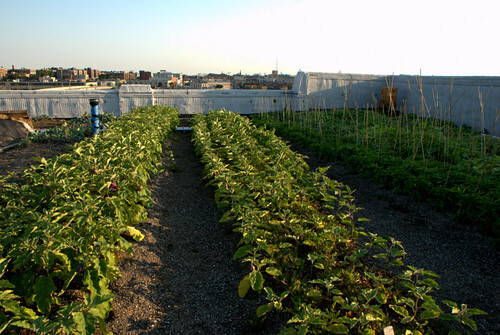 A 40,000 square foot garden on the rooftop of a 6-story building in Queens, New York. It’s called Brooklyn Grange. Their story is awesome and they answer a lot of questions you might have about Urban Gardening. You really need to check out this video and story. I have a whole new appreciation for Urban Gardening. The Brooklyn Grange Farm is believed to be the largest organic rooftop garden in the world. Our one-acre (40,000 square foot) farm in Queens is made up of roughly 1.2 million lbs of soil and over 20,000 linear feet of green roofing material. Can the building hold that much weight? Our farm was designed and installed with the support of engineers and architects who assessed and approved the site. The building was constructed in 1919 and is built like a rock. The roof is made of a thick reinforced concrete slab, which is approved for loads far in excess of the 30 lbs per square foot of materials that we have installed. How is the farm built? Before laying down the soil, we laid down a green roof system, distributed by Conservation Technologies. The system is as follows: a layer of root-barrier, which prevents our plants’ roots from penetrating the surface of the roof; a thick layer of felt; drainage mats with small cups to hold excess water from heavy rainstorms (the soil and plants wick this stored water up in dry conditions to keep our water use down), and finally, a thin layer of felt to prevent the drainage mats from filling up with soil. What are you growing on the roof? There are hundreds of thousands of plants on the roof. Tomatoes are one of our biggest crops: we have 40 varietals planted. We are also growing salad greens, herbs, carrots, fennel, beets, radishes, beans, and many other exciting crops! We grow our vegetables according to organic principles, and we do not use any synthetic fertilizers, insecticides or herbicides. We are not certified organic by the USDA nor do we plan to apply for organic certification. We farm the roof about nine months of the year. In the winter, we will use cover crops like rye, buckwheat, vetch and clover. We sell our produce directly to the community from several weekly farmstands, as well as to several local restaurants. What restaurants carry Brooklyn Grange produce? We sell produce to Roberta’s in Bushwick, Giuseppe Falco at Vesta in Astoria, Marlow & Sons, Joseph Leonard, Fatty ‘Cue, bobo, Eat, Juliette and others. Why is the farm called Brooklyn Grange if it is located in Queens? When we started our company in 2009, we thought we had a site in Brooklyn locked down. We were all living in Brooklyn and put together the plan there, so the name made sense. In spring of 2010 we had to look for a new site; subsequently, we found our current location on Northern Blvd in Queens. At that point, however, we had already established an LLC under the name “Brooklyn Grange,” had begun using the name in public at our fundraisers and events in the winter and didn’t want to confuse the folks who had been following our progress and supporting our efforts. We’ve kept our name as Brooklyn Grange, but we are thrilled with our new home in LIC, Queens and have really enjoyed meeting the community there. The city will always rely on rural farmers for the bulk of our food, and the relationship between urban and rural communities must be celebrated. But having farms inside the city limits by taking advantage of unused roof space is an opportunity not to be missed. Roof farms have the potential to improve urban quality of life, create jobs, increase access to healthy fresh foods, and provide environmental education to those of us who live in and love the city.